Jadeite was first introduced to China from Burma during the late Ming dynasty, although it was not widely used for carvings until late in the eighteenth century when relations with Burma were less volatile following the opening up of borders for greater trade. It was also not accepted as being equal to nephrite until the late Qianlong period. Jadeite tends to have greater transparency than nephrite and comes in a range of colors such as emerald-green, lavender, lilac and blue. 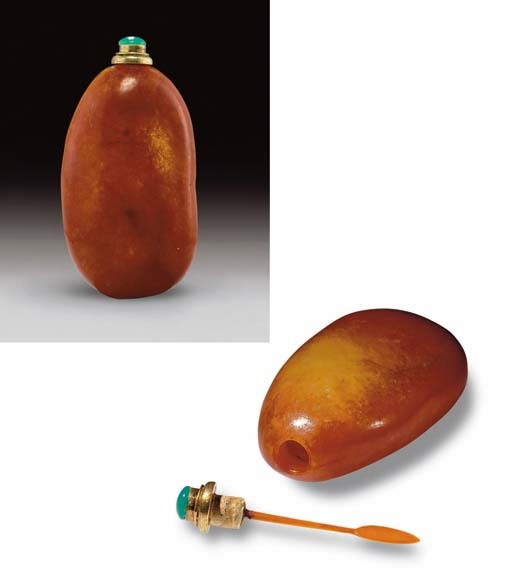 This bottle is of the very rare red variety, which often resembles the russet skin of the richer nephrite pebbles, but here it is the actual color of the stone and not just an outer covering. Red jadeite is rarely red all over, and the intensity of the color may vary considerably. This bottle, however, has a deep, vibrant red on a large proportion of the material, so much so that carved as a pebble it resembles pebble-form nephrite bottles with russet-brown skin. Pebble-form jadeite bottles are very rare, although an emerald-green-flecked white and pale russet jadeite pebble-form bottle, formerly in the E.T. Chow and J & J Collections, was sold in these rooms, 22 March 2007, lot 46. It is not inconceivable that the material was deliberately carved in imitation of, and as homage to, the nephrite predecessors of this form, which were so highly valued by snuff-bottle, and jade connoisseurs alike.